Paddle Style agitators are specially designed to scoop, lift and tumble materials in a gentle, but thorough mixing action. While being mixed, the material travels in a three dimensional "figure 8" pattern. the material is constantly being pulled from the ends of the mixer to the middle of the "figure 8" where the most aggressive mixing is taking place. This unique paddle design is ideal for mixing solids or liquids of various particle size, density and viscosity. The gentle scooping action is ideal for blending fragile ingredients such as nuts or fiberglass strands. Paddle mixers work effectively when filled to as little as 20% of rated capacity, thus allowing flexibility of batch sizes. Paddle style agitators allow easier access for cleaning between batches. 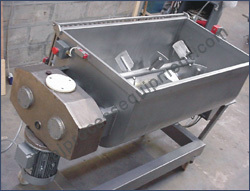 Paddle mixer consists of several elements: a centrally mounted horizontal shaft that rotates within a cylindrical container, paddles, ploughs or other shaped mixing elements that are attached to the centrally mounted shaft, special openings at the top for feeding materials, flush fitting access doors at the front of the mixer, a flush fitting discharge valve at the bottom of the mixer, which is pneumatically or manually operated, inside a cylindrical conduit and a complete drive unit.